I’ve been reading and writing about the Philippines Mail, a newspaper published out of Salinas, CA in the 1930s. A lot has been written about the largely bachelor lives of the Filipinos (whom we now call the manongs) of that period. We know there were only a few Filipinas in the U.S., and, because there were so few of them at the time, and because in most U.S. states Filipinos were not allowed to marry white women, or any U.S. citizen, the males tended to idealize the Filipina. The young Filipina–new to the states–was often invited to social gatherings and dances, but was also placed “on a pedestal,” and fought over. If she didn’t live up to the moral standard, she risked being ostracized within her own community (which was itself constantly under scrutiny from the white population). Aside from oral interviews conducted decades later, there were few texts published during that period that give a sense of what it was like for Filipinas in the U.S. at that time. From the minute she becomes known in the community, her every step is measured and judged—her faults are exaggerated, her good points mocked. No matter how sweet she may be, no matter what good aims and thoughts she entertains in her mind, there is always something wrong, or so it seems to those who always find something to criticize. Constructive criticism is a beneficial thing, but it should never be used to the extent that it hurts. Some girls…have lived to be abused and mistreated. It is these girls who, believing the whole world is wrong, have also followed the wrong path, and have made their lives miserable…I have observed enough, I feel, to enable me to write this article. I, too, was taken away from baby dresses to evening gowns—playgrounds to dances—playmates to admirers. But I am a Filipina, and I want to make my Filipino brothers know me and understand me for what I am. I am anxious to do what I can so that a mutual understanding and no hard feelings may exist between them and myself. And I believe that is every Filipino girl’s thought. She means well; but if her good meanings are not considered, she, too, becomes rebellious. This is an appeal to you, Filipino brothers. Your Filipino sisters want you to treat them as your real sisters—be protective instead of injurious—be considerate instead of fault-finding. They want to be your comrades. They want to be able to speak of you with their heads held high. Would you give them reason to? 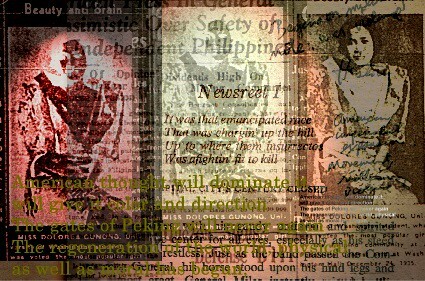 Rillera’s essay questioned the tendency in the male-dominated newspapers, to characterize the Filipina only in the most idealistic terms. Filipinas were often mentioned when they achieved a scholastic honor, won a beauty contest, got married, or sold the most newspaper subscriptions. But little was said about the pressures and contradictions that they faced in the U.S., as a minority within a minority. Next “Can the subaltern tweet”?